Hey everyone, welcome to my hobby thread! If you're looking for one of the colour scheme tutorials from my 'March of the Legions' project or one of the basing tutorials, please check the bottom of this post for all of the relevant links. ​If you can't find what you're looking for or if you have a question that's not answered in the relevant post, please feel free to send me a private message. I've recently been feeling the urge to start a new 40K project. After much musing and many false starts, i've decided on the Thousand Sons, Pre-heresy. They aren't my favourite legion or chapter but the TS have always be a legion full of character, imagery and conversion opportunities. A perfect combination in my opinion. This project has been at least two years in the planning process. It all started when i converted a PH TS sorcerer for a conversion competition at my local GW (which i was lucky enough to win). After building the Sorcerer i knew i had to make some more TS, they are just so fun and different. Unfortunately it has taken me over two years to finally get here. The Sorcerer who started it all. He is a relatively simple kit bash with minimal GS work. I took inspiration from the Thousand Sons art in 'Collected Vissions', especially that of Ahriman and Uthizarr. The test mini. I used bits from several kits to build this terminator, the majority are from the GK terminator kit and the Tomb Guard kit (WHFB). With crest added. I can't decide whether to give all the terminators these crests or just keep them for the squad leaders. Any opinions and suggestions are welcome. A close up of the force weapon. Such a simple conversion but i'm fairly happy with how it turned out. Sorry about the bad lighting. Hopefully this project will develop and progress at a not too slow pace (fingers crossed). I plan on adding some Sisters of Silence and maybe even some Custodes at a later stage. I'm certainly feeling the necessary inspiration at the moment. Any and all suggestions and advice are more than welcome, as are questions and queries. Edited by Kizzdougs, 09 April 2019 - 01:10 PM. I really like the conversions so far, but I'm not sold on the crests for the termies - it doesn't look integrated enough, like, well... like it was just slapped on from another kit. I love the force halberds though. i just finished reading a thousand sons and this is just what i imagined! its looking awesome but i think the crest should be on squad leaders, it will single them out and it won't make your other termies look over done. Love the terminator. I think the crests should be squad leaders only, since they look more compact and brutal without it, but a bit taller and more sophisticated with it. Gonna follow this tough, since I love the PH TS. How did you do the halbrid conversion? It looks so seamless and well done. Loving the terminators, they've larger but not to the extreme of true-scale. Looks good, although I'm also not entirely sure about the termie crests. If you can get them to look integrated, you might want to keep them for just your champions. @Astrum Vinco: The Halber was made from a GK halberd and a Tomb Guard (Tomb kings from WHFB) halberd. I cut the GK halberd off just past the power cell and also removed the cross-guard. The Tomb Guard halberd was cut off right where the blade joins the haft. I agree with the common consensus, regarding the crest on the Terminator, and have decided against using it. I'll find a different way to make my leaders stand out. I started painting the first terminator today and thought i would share some pictures of the progress so far. Stage 1. Three thinned coats of Mechrite Red. Stage 2. Ater the Mechrite i 'Blacck lined' the termi with a 40/40/20 mix of Mechrite, Liche and Black. Stage 3. I then highlighted with pure Blood Red. Stage 4. To finish off i applied a highlight of 50/50 Blood red and Golden Yellow. The rough equivalent of Blazing Orange. Over all i'm fairly happy with how the paint job is turning out so far. Some of the Blood Red highlights are a bit too thick (especially on the right hand vambrace/forearm). Finally i thought i would show a WIP pic of the next Terminator. None of the pieces are glued together yet and i still need to apply Green Stuff to the left side of the torso. I haven't decide of his armament yet either. I've just started to base coat the Gold on the first Termi. I'm using a mix of Shining Gold and Khemri Brown. The Khemri really helps with coverage. Again, thanks for the kind words and advice. One idea I just had for the sargents would be to take an icon of Tzeentch from the chaos vehicle hatch sprue, and find a way to apply it to the sargent's back so its visible from above? Kinda like the signs the Imperials like to paint on the tops of their rhinos. @darth_giles: Thanks for the idea mate, although I think an icon of Tzeench may be a little un subtle I was planning on giving the characters and champions Tutelaries (demonic familiars disguised as angels and such) to hint at their darker side. I have just finished doing some work on the next terminator and thought i would show you all some pics. Let me know what you think. Edited by kizzdougs, 18 August 2011 - 12:16 PM. No problem. I guess its because I'm working on a Word Bearers' force, they're about as subtle as a thunder hammer to the face. Ok, question time. Where did you get those heads and shoulder pads? Particularly the heads? Edited by darth_giles, 18 August 2011 - 01:28 PM. Nice conversion and good paintjob! ...and that's only the test mini! EDIT: May I point you to an excellent PH website, the Great Crusade (link in signature). Edited by PorridgeMeister, 18 August 2011 - 04:51 PM. ~ Love and kisses, your friendly neighbourhood Porridge. Why not check out these cool and useful links for online 40k? Lexicanum - concise, comprehensive, incorrigible stockpile. 1d4chan - bitingly funny and crude insight into our hobby. Thanks mate. I'm already registered on The Great Crusade, same user name, but i don't visit it as often as the B&C. Would you suggest that I start a project blog on the GC? Edited by kizzdougs, 19 August 2011 - 11:50 AM. Some more progress on terminator1. Sorry for the single pic post. I'm fairly happy with the results so far. I had some fun with the gems which are always a personal favourite. C&C welcome as always. These are looking really good mate. I like the red you have going. About the crests for squad leaders. Is there no way you can have them folloying the same lines as the post heresy termis trophy racks? As in maybe cut the crest in half and have the curved edge to the back of the termi armour? It would add some height to them sure enough not sure if it would really work though. Just a suggestion. Woot, thanks. 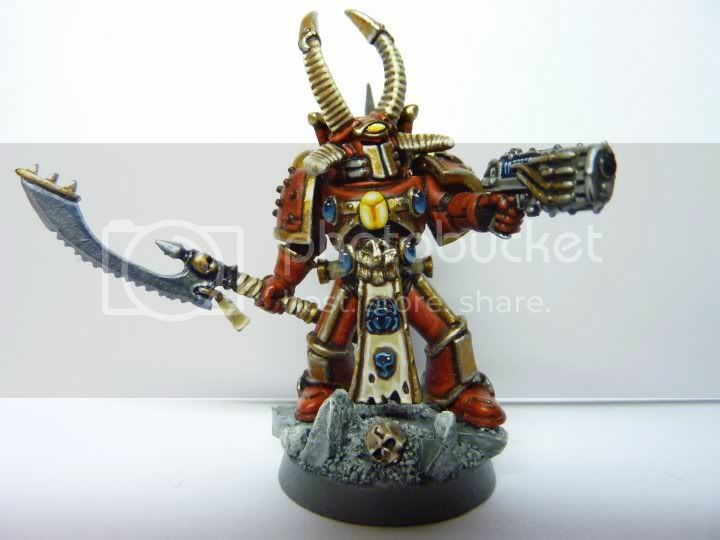 I'm looking to do something similar for a Word Bearers army using the GK bodies, and those heads look like they'll work better than the standard Chaos ones. Plus the GKs actually come with enough power weapons for a Chaos force; the CSM box only comes with two for a squad of five so you're stuck with two PFs and a chainfist. I absolutely adore that painted Terminators, you have some excellent brush-fu and seem to be a brilliant sculptor as well. I don't really have anything bad to say about this at all. What basing style are you going with for them? Very very nice terminator. The blending transition could use a little more work on the right arm arm and armour plates, but overall a very solid work. The gems look very nice. I am lousy at painting gems so I always get a bit jealous when I see someone else pulling it off nicely. Well The Sekhmet are slowly progressing, slowly. Sorry for the poor lighting in the pics. I'm trying to decide on a theme for the bases. So far i'm trying to decide between desert and paving stones. Edited by kizzdougs, 26 August 2011 - 11:08 AM. this just looks beautiful! i love your thousand sons so much. you should have it with sand on the base like the planet they are on in the start of a thousand sons. "It doesn't make any sense...why would Sandpeople want to slaughter Guardsmen?" "They didn't, but we were meant to think they did." "Look there's Gaffi Sticks, Bantha tracks..."
"Look at these blast points, only troops with Ballistic Skill 4 are so precise. Not that they had to be - that thing was AV 10 on the side..."